Nazarbayev’s retirement has shined a spotlight on other aging leaders who have no clear succession plans. 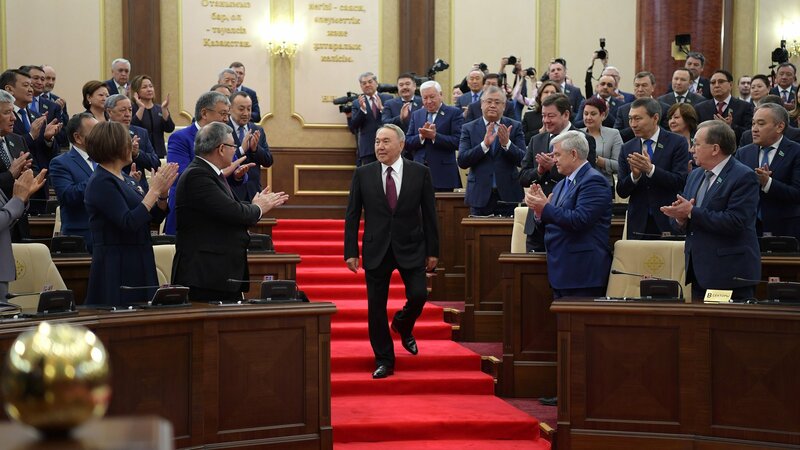 The Western analyst consensus is that Nursultan Nazarbayev, who stepped down this week after almost 30 years as Kazakhstan’s president, will continue to wield considerable power. And by stepping down, rather than dying in office, Nazarbayev may have set a precedent. At the very least, the novelty of the longest-serving former-Soviet head of state choosing when to make space at the top (quite possibly for his daughter) has shined a spotlight on other aging leaders who lack clear succession plans. Nazarbayev may have taken a lesson from the 2016 death of Islam Karimov in neighboring Uzbekistan: If a family is to hold onto power – or at least the worldly possessions it accumulated while in power – it's a good idea to make arrangements before passing away. Unclear is if that lesson has been absorbed elsewhere. Across the region, authoritarian leaders this week stressed the importance of the status quo. It’s widely assumed that Putin, 66, will seek to maintain influence after stepping down. He and Nazarbayev share similar authoritarian and economic systems, Baunov said, arguing that “the Kremlin will be able to observe in practice” Nazarbayev’s experiment and see how or how not to perform a political transition. No matter who ultimately becomes Kazakhstan's president, Nazarbayev’s experiment will remain significant, both empirically and rhetorically, for years to come. Other authoritarians confronting transition will be able to legitimize their choice by utilizing Kazakhstan as a positive or negative example. They will be carefully watching what happens next, to see if a Nazarbayev scenario can offer the stability they all crave. Sarah Dorr is a visiting research fellow in the School of Politics and International Studies at the University of Leeds, England.